Demonstrate use of methods that provide relief. Investigate verbal reports of pain, noting specific location and intensity (0–10 scale). Note factors that aggravate and relieve pain. Rationale: Pain is often diffuse, severe, and unrelenting in acute or hemorrhagic pancreatitis. Severe pain is often the major symptom in patients with chronic pancreatitis. Isolated pain in the RUQ reflects involvement of the head of the pancreas. Pain in the left upper quadrant (LUQ) suggests involvement of the pancreatic tail. Localized pain may indicate development of pseudocysts or abscesses. Maintain bedrest during acute attack. Provide quiet, restful environment. Rationale: Decreases metabolic rate and GI stimulation and secretions, thereby reducing pancreatic activity. Promote position of comfort on one side with knees flexed, sitting up and leaning forward. Rationale: Reduces abdominal pressure and tension, providing some measure of comfort and pain relief. Note: Supine position often increases pain. Provide alternative comfort measures (back rub), encourage relaxation techniques (guided imagery, visualization), quiet diversional activities (TV, radio). Rationale: Promotes relaxation and enables patient to refocus attention; may enhance coping. Keep environment free of food odors. Rationale: Sensory stimulation can activate pancreatic enzymes, increasing pain. Administer analgesics in timely manner (smaller, more frequent doses). Rationale: Severe and prolonged pain can aggravate shock and is more difficult to relieve, requiring larger doses of medication, which can mask underlying problems and complications and may contribute to respiratory depression. Maintain meticulous skin care, especially in presence of draining abdominal wall fistulas. 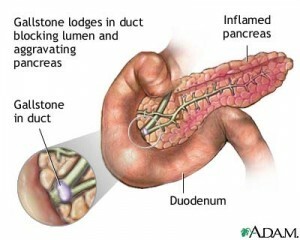 Rationale: Pancreatic enzymes can digest the skin and tissues of the abdominal wall, creating a chemical burn. Rationale: Meperidine is usually effective in relieving pain and may be preferred over morphine, which can have a side effect of biliary-pancreatic spasms. Paravertebral block has been used to achieve prolonged pain control. Note:Pain in patients whohave recurrent or chronic pancreatitis episodes may be difficult to manage because they may become dependent on the narcotics given for pain control. Rationale: Potentiates action of narcotic to promote rest and to reduce muscular and ductal spasm, thereby reducing metabolic needs, enzyme secretions. Rationale: Neutralizes gastric acid to reduce production of pancreatic enzymes and to reduce incidence of upper GI bleeding. Rationale: Decreasing secretion of HCl reduces stimulation of the pancreas and associated pain. Withhold food and fluid as indicated. Rationale: Limits and reduces release of pancreatic enzymes and resultant pain. Maintain gastric suction when used. Rationale: Prevents accumulation of gastric secretions, which can stimulate pancreatic enzyme activity. Rationale: Surgical exploration may be required in presence of intractable pain and complications involving the biliary tract, such as pancreatic abscess or pseudocyst. Maintain adequate hydration as evidenced by stable vital signs, good skin turgor, prompt capillary refill, strong peripheral pulses, and individually appropriate urinary output. Monitor BP and measure CVP if available. Rationale: Fluid sequestration (shifts into third space), bleeding, and release of vasodilators (kinins) and cardiac depressant factor triggered by pancreatic ischemia may result in profound hypotension. Reduced cardiac output and poor organ perfusion secondary to a hypotensive episode can precipitate widespread systemic complications. Measure I&O including vomiting, gastric aspirate, diarrhea. Calculate 24-hr fluid balance. Rationale: Indicators of replacement needs and effectiveness of therapy. Note decrease in urine output (less than 400 mL per 24 hr). Rationale: Oliguria may occur, signaling renal impairment and acute tubular necrosis (ATN), related to increase in renal vascular resistance or reduced and altered renal blood flow. Record color and character of gastric drainage, measure pH, and note presence of occult blood. Rationale: Risk of gastric bleeding and hemorrhage is high. Weigh as indicated. Correlate with calculated fluid balance. Rationale: Weight loss may suggest hypovolemia; however, edema, fluid retention, and ascites may be reflected by increased or stable weight, even in the presence of muscle wasting. Note poor skin turgor, dry skin and mucous membranes, reports of thirst. Rationale: Further physiological indicators of dehydration. Observe and record peripheral and dependent edema. Measure abdominal girth if ascites present. Rationale: Edema and fluid shifts occur as a result of increased vascular permeability, sodium retention, and decreased colloid osmotic pressure in the intravascular compartment.Note: Fluid loss (sequestration) of more than 6 L per 48 hr is considered a poor prognostic sign. Investigate changes in sensorium (confusion, slowed responses). Rationale: Changes may be related to hypovolemia, hypoxia, electrolyte imbalance, or impending delirium tremens (in patient with acute pancreatitis secondary to excessive alcohol intake). Severe pancreatic disease may cause toxic psychosis. Auscultate heart sounds; note rate and rhythm. Monitor and document rhythm, changes. Rationale: Cardiac changes and dysrhythmias may reflect hypovolemia or electrolyte imbalance, commonly hypokalemia and hypocalcemia. Hyperkalemia may occur related to tissue necrosis, acidosis, and renal insufficiency and may precipitate lethal dysrhythmias if uncorrected. S3 gallop in conjunction with JVD and crackles suggest HF or pulmonary edema. Note: Cardiovascular complications are common and include MI, pericarditis, and pericardial effusion with or without tamponade. Inspect skin for petechiae, hematomas, and unusual wound or venipuncture bleeding. Note hematuria, mucous membrane bleeding, and bloody gastric contents. Rationale: DIC may be initiated by release of active pancreatic proteases into the circulation. The most frequently affected organs are the kidneys, skin, and lungs. Watch out for signs and symptoms of calcium deficiency. Observe and report coarse muscle tremors, twitching, positive Chvostek’s, Trousseau’s sign, tetany, cramps, carpopedal spasm, and seizures. Rationale: Symptoms of calcium imbalance. Calcium binds with free fats in the intestine and is lost by excretion in the stool. Keep airway and suction apparatus handy and pad side rails. Administer fluid replacement as indicated (saline solutions, albumin, blood, blood products, dextran). Rationale: Choice of replacement solution may be less important than rapidity and adequacy of volume restoration. Saline solutions and albumin may be used to promote mobilization of fluid back into vascular space. Low-molecular-weight dextran is sometimes used to reduce risk of renal dysfunction and pulmonary edema associated with pancreatitis. Monitor laboratory studies (Hb and Hct, Protein, albumin, electrolytes, BUN, creatinine, urine osmolality and sodium, potassium, coagulation studies). Rationale: Identifies deficits and replacement needs and developing complications (ATN, DIC). Replace electrolytes (sodium, potassium, chloride, calcium as indicated). Rationale: Decreased oral intake and excessive losses greatly affect electrolyte and acid-base balance, which is necessary to maintain optimal cellular and organ function. Prepare and assist with peritoneal lavage, hemoperitoneal dialysis. Rationale: Removes toxic chemicals and pancreatic enzymes and allows for more rapid correction of metabolic abnormalities in severe and unresponsive cases of acute pancreatitis. Experience no signs of malnutrition. Demonstrate behaviors, lifestyle changes to regain and/or maintain appropriate weight. Assess abdomen, noting presence and character of bowel sounds, abdominal distension, and reports of nausea. Rationale: Gastric distention and intestinal atony are frequently present, resulting in reduced and absent bowel sounds. Return of bowel sounds and relief of symptoms signal readiness for discontinuation of gastric aspiration (NG tube). Rationale: Decreases vomiting stimulus and inflammation and irritation of dry mucous membranes associated with dehydration and mouth breathing when NG is in place. Assist patient in selecting food and fluids that meet nutritional needs and restrictions when diet is resumed. Rationale: Previous dietary habits may be unsatisfactory in meeting current needs for tissue regeneration and healing. Use of gastric stimulants (caffeine, alcohol, cigarettes, gas-producing foods), or ingestion of large meals may result in excessive stimulation of the pancreas and recurrence of symptoms. Observe color, consistency and amount of stools. Note frothy consistency and foul odor. Rationale: Steatorrhea may develop from incomplete digestion of fats. Note signs of increased thirst and urination or changes in mentation and visual acuity. Rationale: May warn of developing hyperglycemia associated with increased release of glucagon (damage to [beta] cells) or decreased release of insulin (damage to [beta] cells). Test urine for sugar and acetone. Rationale: Early detection of inadequate glucose utilization may prevent development of ketoacidosis. Maintain NPO status and gastric suctioning in acute phase. Rationale: Prevents stimulation and release of pancreatic enzymes (secretin), released when chyme and HCl enter the duodenum. Administer hyperalimentation and lipids, if indicated. Rationale: IV administration of calories, lipids, and amino acids should be instituted before nutrition and nitrogen depletion is advanced. Resume oral intake with clear liquids and advance diet slowly to provide high-protein, high-carbohydrate diet, when indicated. Rationale: Oral feedings given too early in the course of illness may exacerbate symptoms. Loss of pancreatic function and reduced insulin production may require initiation of a diabetic diet. Provide medium-chain triglycerides (MCTs) (MCT, Portagen). Rationale: MCTs are elements of enteral feedings (NG or J-tube) that provide supplemental calories and nutrients that do not require pancreatic enzymes for digestion and absorption. Rationale: Replacement required because fat metabolism is altered, reducing absorption and storage of fat-soluble vitamins. Replacement enzymes: pancreatin (Dizymes), pancrelipase (Viokase, Cotazym). Rationale: Used in chronic pancreatitis to correct deficiencies to promote digestion and absorption of nutrients. Rationale: Indicator of insulin needs because hyperglycemia is frequently present, although not usually in levels high enough to produce ketoacidosis. Rationale: Corrects persistent hyperglycemia caused by injury to cells and increased release of glucocorticoids. Insulin therapy is usually short-term unless permanent damage to pancreas occurs. Achieve timely healing, be free of signs of infection. Participate in activities to reduce risk of infection. Use strict aseptic technique when changing surgical dressings or working with IV lines, indwelling catheters and tubes, drains. Change soiled dressings promptly. Rationale: Limits sources of infection, which can lead to sepsis in a compromised patient. Note: Studies indicate that infectious complications are responsible for about 80% of deaths associated with pancreatitis. Stress importance of good handwashing. Rationale: Reduces risk of cross-contamination. Observe rate and characteristics of respirations, breath sounds. Note occurrence of cough and sputum production. Rationale: Fluid accumulation and limited mobility predispose to respiratory infections and atelectasis. Accumulation of ascites fluid may cause elevated diaphragm and shallow abdominal breathing. Encourage frequent position changes, deep breathing, and coughing. Assist with ambulation as soon as stable. Rationale: Enhances ventilation of all lung segments and promotes mobilization of secretions. Rationale: Cholestatic jaundice and decreased pulmonary function may be first sign of sepsis involving Gram-negative organisms. Increased abdominal pain and tenderness, recurrent fever (higher than 101°F), leukocytosis, hypotension, tachycardia, and chills. Rationale: Abscesses can occur 2 wk or more after the onset of pancreatitis (mortality can exceed 50%) and should be suspected whenever patient is deteriorating despite supportive measures. Obtain culture specimens (blood, wound, urine, sputum, or pancreatic aspirate). Rationale: Identifies presence of infection and causative organism. Administer antibiotic therapy as indicated: cephalosporins, cefoxitin sodium (Mefoxin); plus aminoglycosides: gentamicin (Garamycin), tobramycin (Nebcin). Rationale: Broad-spectrum antibiotics are generally recommended for sepsis; however, therapy will be based on the specific organisms cultured. Prepare for surgical intervention as necessary. Rationale: Abscesses may be surgically drained with resection of necrotic tissue. Sump tubes may be inserted for antibiotic irrigation and drainage of pancreatic debris. Pseudocysts (persisting for several weeks), may be drained because of the risk and incidence of infection and rupture. Review specific cause of current episode and prognosis. Rationale: Provides knowledge base on which patient can make informed choices. Discuss other causative and associated factors such as excessive alcohol intake, gallbladder disease, duodenal ulcer, hyper -lipoproteinemias, some drugs (oral contraceptives, thiazides, furosemide [Lasix], isoniazid [INH], glucocorticoids, sulfonamides). Rationale: Avoidance may help limit damage and prevent development of a chronic condition. Explore availability of treatment programs and rehabilitation of chemical dependency if indicated. Rationale: Alcohol abuse is currently the most common cause of recurrence of chronic pancreatitis. Usage of other drugs, whether prescribed or illicit, is increasing as a factor.Note: Pain of pancreatitis can be severe and prolonged and may lead to narcotic dependence, requiring need for referral to pain clinic. Stress the importance of follow-up care, and review symptoms that need to be reported immediately to physician (recurrence of pain, persistent fever, nausea and vomiting, abdominal distension, frothy and foul-smelling stools, general intolerance of food). Rationale: Prolonged recovery period requires close monitoring to prevent recurrence and complications (infection, pancreatic pseudocysts). Review importance of initially continuing bland, low-fat diet with frequent small feedings and restricted caffeine, with gradual resumption of a normal diet within individual tolerance. Rationale: Understanding the purpose of the diet in maximizing the use of available enzymes while avoiding overstimulation of the pancreas may enhance patient involvement in self-monitoring of dietary needs and responses to foods. Instruct in use of pancreatic enzyme replacements and bile salt therapy as indicated, avoiding concomitant ingestion of hot foods and fluids. Rationale: If permanent damage to the pancreas has occurred, exocrine deficiencies will occur, requiring long-term replacement. Hot foods and fluids can inactivate enzymes. Rationale: Nicotine stimulates gastric secretions and unnecessary pancreatic activity. Discuss signs and symptoms of diabetes mellitus (polydipsia, polyuria, weakness, weight loss). Rationale: Damage to the [beta] cells may result in a temporary or permanent alteration of insulin production. Nursing Diagnosis: Acute pain related to inflammation of the pancreas and surrounding tissue, biliary tract disease, obstruction of pancreatic ducts, and interruption of the blood supply. Patient will report pain is relieved/controlled. Patient will follow prescribed pharmacological regimen. Verbalize nonpharmacologic methods that provide relief. Rationale: Individuals with external locus of control may take little or no responsibility for pain management. Rationale: Pain is a subjective experience and cannot be felt by others. Rationale: To medicate prophylactically, as appropriate. Rationale: To promote nonpharmacological pain management. Administer analgesics as indicated to maximum dosage, as needed. Rationale: To maintain acceptable level of pain. Evaluate and document client’s response to analgesia and assist in transitioning or changing drug regimen based on individual needs. Rationale: Increasing or decreasing dosage, stepped program (switching from injection to oral route, increased time span as pain lessens) helps in self-management of pain. Note: A risk diagnosis is not evidenced by signs and symptoms, as the problem has not occurred and nursing interventions are directed at prevention. Patient will demonstrate adequate fluid balance as evidenced by stable vital signs, palpable pulses (good quality); normal skin turgor, moist mucous membranes; individual appropriate urinary output; lack of excessive weight fluctuation; and no edema present. Patient will maintain fluid volume at a functional level as evidenced by individually adequate urinary output, stable vital signs. Patient will verbalize understanding of causative factors and purpose of individual therapeutic interventions and medications. Note client’s age, current level of hydration, and mentation. Rationale: Provides information regarding ability to tolerate fluctuations in fluid level and risk for creating or failing to respond to problem. Estimate or calculate insensible fluid losses. Rationale: To include in replacement calculations. Weigh daily, or as indicated and evaluate changes. Rationale: As they relate to fluid status. Auscultate BP, calculate pulse pressure. Rationale: Pulse pressure widens before systolic BP drops in response to fluid loss. Rationale: Electrolyte imbalances may be present. Discuss individual risk factors or potential problems and specific interventions. Rationale: To prevent or limit occurrence of fluid deficit/excess. Administer IV fluids, as prescribed, using infusion pumps. Rationale: To deliver fluids accurately and at desired rates to prevent either under infusion or over infusion. Nursing Diagnosis: Imbalanced Nutrition: Less Than Body Requirements related to inability to ingest or digest food or absorb nutrients as evidenced by nausea and vomiting, NPO status, and nasogastric suctioning. Body weight 20% or more under ideal [for height and frame]; decreased subcutaneous fat or muscle mass. Loss of weight with adequate food intake. Sore buccal cavity; pale mucous membranes; capillary fragility. Patient will demonstrate progressive weight gain toward goal. Patient will display normalization of laboratory values and be free of signs of malnutrition. Patient will verbalize understanding of causative factors when known and necessary interventions. Patient will demonstrate behaviors, lifestyle changes to regain and/or maintain appropriate weight. Determine the client’s ability to chew, swallow and taste food. Rationale: All factors that can affect ingestion and/or digestion of nutrients. Discuss eating habits, including food preferences, intolerance/aversions. Rationale: To appeal to client’s likes/dislikes. Evaluate total daily food intake. Rationale: To reveal possible cause of malnutrition or changes that could be made in client’s intake. Rationale: It may lead to early satiety. Rationale: To reduce possibility of early satiety. Encourage client to choose foods. Rationale: To monitor effectiveness of efforts. Nutrition: imbalanced, less than body requirements—preexisting malnutrition, prescribed dietary restrictions, persistent nausea/vomiting, imbalances in digestive enzymes. Pain, acute/chronic—chemical irritation of peritoneal surfaces by pancreatic enzymes, spasms of biliary ducts, general inflammatory process. Therapeutic Regimen: ineffective management—complexity of therapeutic regimen, economic difficulties, mistrust of regimen, perceived benefit, social support deficits.